"I'm living proof that a mind... a mind is a terrible thing." In 1997, Paramount released Kiss the Girls, adapted from James Patterson's novel, starring Morgan Freeman as detective Alex Cross, on the trail of a serial killer. The film was moderately successful, and Cross returned to the big screen in 2001 in Along Came a Spider, also adapted from a Patterson novel. This time around, Cross is drawn into a bizarre kidnapping case when he is contacted by the culprit himself, one Gary Soneji (Michael Wincott). The methodical Soneji has assumed the role of a private school teacher in order to kidnap little Megan Rose (Mika Boorem), daughter of Senator Hank and Elizabeth Rose (Michael Moriarty and Penelope Ann Miller). Cross must attempt to profile the kidnapper, rescue the girl and solve the crime, with the assistance of troubled Secret Service agent Jezzie Flanagan (Monica Potter), on whose watch Megan was spirited away. Morgan Freeman is one of those rare actors whose presence can elevate just about any script into the realm of watchability. And he is well cast as Detective Cross, a mature, compassionate sleuth whose insight and intelligence serve him well on the job. Freeman is joined by Monica Potter, who here resembles a cross between Julia Roberts and Juliette Lewis as she tries to find the substance of her underwritten character, and Michael Wincott, who gleefully chews the scenery as Soneji. Young Mika Boorem is convincing as the resourceful Megan Rose, Dylan Baker is effective as an uptight FBI agent, and the rest of the supporting cast does a credible job. Director Lee Tamahori brings a nice sense of pacing to the project, particularly in the dramatic opening sequence—despite some questionable CG effects, this brief segment is full of surprises and sudden shocks that get the movie off to a roaring start. Tamahori balances the story's talkier scenes with economically constructed bits of action, and he successfully keeps the audience off-balance, navigating the plot's numerous twists and turns without giving the game away or foreshadowing any development too overtly. Unfortunately, as much fun as the ride can be, Along Came a Spider eventually begins to seem... silly. A nicely-constructed first act segues into a pointless second act that seems lifted from other, better action movies, and the events of the third act rapidly stretch credibility beyond the breaking point. Too many strong ideas are tossed aside, and several developed characters are forced into bizarre behaviors for the sake of a plot point. Worse, the central character of Alex Cross begins to seem like a pawn in his own story, buffeted about by plot developments with little rhyme or reason. Instead of marveling at Cross's intuition and skill, or fretting over the fate of little Megan, the audience finds itself with no emotional anchor as the story bounces awkwardly to its conclusion. Betrayals and surprises are plentiful, to be sure, but it becomes very difficult to care what happens. 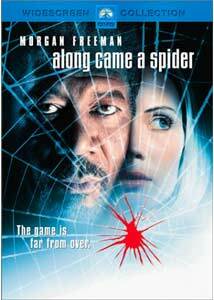 Along Came a Spider wants to be a suspense thriller in the grand tradition—but ultimately, the pot boileth over. Image Transfer Review: Along Came a Spider is presented in its original 2.35:1 Panavision theatrical aspect ratio, with a solid anamorphic transfer drawn from a fresh source print. Color is natural, detail is crisp, and there's no distracting edge enhancement. The film's many darker scenes benefit from solid shadow detail, and the dual-layer digital transfer is definitely up to contemporary DVD standards. Audio Transfer Review: The disc includes its original English audio in Dolby Digital 5.1 and Dolby 2.0 Surround formats, as well as a dubbed French 2.0 track. The sound mix is generally conservative, with dialogue in the center channel and just a few pans enhancing traffic sounds and other atmospherics. Jerry Goldsmith's score occupies the soundstage more fully, with a robust, enveloping sound that enhances the film's best moments. The 2.0 tracks don't suffer badly by comparison, though the 5.1 mix is certainly the superior presentation. A crisp, clean and solid presentation of this recent production. Extras Review: The spider's web snags few extras here, just 12 picture-menu chapter stops, optional English subtitles, a theatrical trailer and a promotional featurette. The trailer quality is disappointing, presented in a soft-looking 1.85:1 non-anamorphic letterboxed transfer with Dolby 2.0 Surround audio. The fourteen-minute Making of Along Came a Spider featurette is a standard Hollywood advertorial piece, consisting of clips from the film and sound-bite interviews, tied together with needlessly ominous narration. It refrains from giving away any key plot points, but it's a superficial "supplement" at best. A poor showing in this department. Along Came a Spider is a stylish, outlandish thriller that starts strong but eventually sinks under the weight of its own contrivances. Paramount's DVD features solid audio and video, though extras are minimal and there are better thrillers out there.